Titanium drusy comes from human high-tech enhancement of natural drusy gemstones. A drusy is a colored mineral gemstone such as agate, garnet, calcite, carnelian, hematite or pyrite that shows a sparkly surface texture like fine sugar crystals. Drusy gemstones, according to gemstone dealer Maxam Magnata, get their unique sparkle from thousands of tiny quartz crystals covering their surface like newly fallen snow. Drusy gemstones are graded by color saturation, crystal size, crystal coverage of the specimen and number of visible cracks and other flaws. Natural drusy gemstones occur in a variety of colors, according to Bernardine Gemstones. 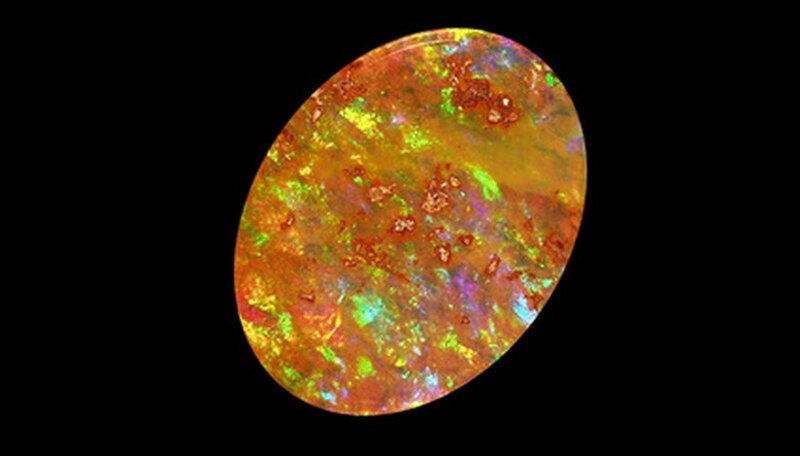 But jewelers discovered they could create new colors not found in nature by depositing a film of metal only a few atoms thick on a natural drusy gemstone through high-tech chemical vapor deposition in a vacuum chamber. The metal atoms bond to the quartz to produce vivid colors. Depositing the metal titanium on a drusy stone produces a range of blue colors from an iridescent blue-white through a range of increasingly deeper blue shades to a royal purple, says Maxam Magnata. Drusy stones may be coated with other metals such as cobalt, gold, silver or platinum to create different color effects. Drusy stones formed millions of years ago when hot groundwater saturated with silica penetrated porous mineral layers, says Bernardine Gemstones. The rock cooled the water enough for the silica to crystallize into quartz, which filled the pores of the mineral layer. Over geologic eons, the mineral layer worked its way to the surface, where humans discovered these pretty sparkling rocks and made drusy jewelry from them. Drusy stones have been known for many years, but became popular as jewelry only in the last 10 years or so. Drusy stones are mined in the United States, Mexico and parts of South America, Africa and Europe. Drusy gemstones are somewhat fragile so they are best suited for earrings, brooches, pendants and slides, according to Maxam Magnata. They aren’t recommended for rings, bracelets or cuff links because the tiny quartz crystals that give drusy stones their sparkle can be knocked from the gemstone matrix by contact with hard surfaces. Drusy simply can’t take the beating of everyday wear. Jewelers who set drusy stones in these types of jewelry typically use a “shadow box” setting where the sides of the bezel are higher than the stone, offering some protection. The upsurge in popularity for drusy gemstones has led to drusy fakes coming on the market, warns eBay Guides. For example, unscrupulous manufacturers and individuals create phony titanium drusy by taking a cheap, low-quality drusy gemstone and wiping it with thin blue paint. The painted fakes under magnification show paint in the grooves of the specimen and exhibit little sparkle. Genuine titanium drusy preserves the crystal structure that gives these gemstones their bright blue sparkle. How Is Garnet Mined & Processed?